Ukrainian Orthodox Church of the USA - 63rd Annual UOL Convention! 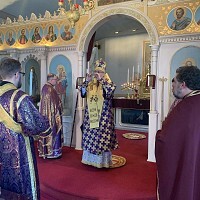 For the 63rd time, since 1947, when His Beatitude Metropolitan John (Theodorovich) blessed the convocation of the first Ukrainian Orthodox League Convention, delegates from local chapters throughout the Ukrainian Orthodox Church of the USA have gathered in Morristown, NJ for the annual convention of the Ukrainian Orthodox League of the USA. This year’s gathering is hosted by Holy Ascension Senior and Junior UOL Chapter of the Holy Ascension Ukrainian Orthodox parish in Maplewood, NJ and working sessions began on Thursday, July 29, 2010 until will continue through Sunday, August 1, 2010. His Beatitude Metropolitan Constantine opened the annual Convention with the celebration of the Divine Liturgy of St. John Chrysostom in the convention chapel of Hyatt Regency hotel. All three hierarchs of the Ukrainian Orthodox Church of the USA – Metropolitan Constantine, Archbishop Antony and Bishop Daniel – are present at the convention to provide spiritual guidance under the convention theme: “Train up a child in the way he should go: and when he is old, he will not depart from it.” (Proverbs 22:6). Concelebrating with the Metropolitan at the Liturgy were Spiritual Advisors to the League: V. Rev. Fr. Myron Oryhon of the Senior UOL and Rev. Fr. Anthony Perkins of the Junior UO, as well as V. Rev. Fr. Oleh Hucul, Pastor of Holy Ascension Parish and Spiritual Advisor to the convention committee and Protodeacon Ihor Mahlay of St. Vladimir Ukrainian Orthodox Cathedral in Parma, OH. In his remarks Metropolitan Constantine welcomed the delegates to the Convention, calling upon them to follow in the footsteps of the founding members of the UOL, providing support to each other as we journey through the 21st century, living our Holy Orthodox Faith. His Beatitude was visibly moved when the faithful joyfully sang “Mnohaya Lita” in honor of his birthday that very day! Following opening ceremonies and prayers with the Jr. and Sr. convention bodies gathered together, the Presidents of the two organizations, Oleh Bilynsky – Senior and Taylor Gladys – Junior, greeted the participants and set the tone for a serious examination of the League’s work during the past year and comprehensive planning for the years to come. The convention discussions this year have taken a different form. The committees and commissions already existent to accomplish the ongoing work of the UOL will continue to do so in years to come. The goal for this convention is to discuss where the UOL will be – or rather, where the UOL wants to be ten years from today in 2020. The discussions took up most of the time of the first day’s sessions and will conclude at sessions on Friday afternoon. In the afternoon hours of the day, the delegates listened to a brief presentation by Michael Nakonachny about the needs of All Saints Camp in repairing and maintaining all the cabins and other buildings, which are part of the camp. Michael challenged all present to become actively involved in the effort to preserve our camp for future generations. A special moment of the day occurred when Oleh Bilynsky presented a check for over $2,000 to the president of the UOC of USA St. Andrew Society, Protodeacon Dr. Ihor Mahlay, to assist the Society in its soup kitchen programs in Ukraine. The funds were collected by UOL chapters during it’s annual “Souper Bowl” campaign. The day concluded with the entire convention body traveling to a NJ port on the Hudson River for Dinner/Cruise on the Majestic Princess Ship, which took the group all the way around Manhattan Island – New York City. “What is the future of the organization that brought me up and keeps touching the lives of my children with the love of Christ?” – this was the question that sounded from one end of the convention hall to the other among the delegates on the second day of its work. At the beginning of the working session on Friday, July 30th, His Eminence Archbishop Antony addressed the delegates of the 63rd Annual UOL Convention, concentrating on the convention theme: ““Train up a child in the way he should go: and when he is old, he will not depart from it.” (Pr. 22:6) The Archbishop stressed to the UOL membership that they could not possibly “train up their children in the way they should go” if they, themselves, do not know the way they should go, or if they have not gone that way as an example for their children. “You cannot be Christ to your children if you do not know Christ at an intimate level. You cannot teach your children about the inspiration of the Holy Spirit in your life if you have not allowed the Holy Spirit to permeate your existence and to be the guiding force in your life” the Archbishop said. Trust in God cannot be “faked”…it becomes natural only when it is a real trust – when it is not – the “little ones”, as Christ calls our children, will be the first to recognize it – and they will lose trust in their parents or grandparents or uncles or aunts who exhibit no real trust in God – and the most sad consequence is that they will never learn to trust God themselves. The UOL Convention body reflected over several hours the “20/20 vision for UOL”. Michael Komichak, Co-Chairman of this year’s convention challenged the delegates to approach the ministry and mission of the organization from a new angle – what should the UOL be and what should it accomplish over the next decade. The delegates, divided into small groups spent their time working, reflecting, and challenging each other on issues of moral and social context. The issues of technological and scientific progress brought up a lively discussion on ways and means of reaching out to a younger generation of active Ukrainian Orthodox League members that are to become the future leaders of their Church. Leadership training and the retention of our youth were presented by almost every small group. All three hierarchs visited the Junior Convention, which is conducted separately from the Senior Convention. They challenged the upcoming generation to face with zeal the challenges of our society, while remaining dedicated and devoted to Christ and His Holy Orthodox Faith. The hierarchs answered numerous questions that the youth of the Church posed to them, addressing moral concerns of their daily life and the influence of technological progress on the development of the future active Ukrainian Orthodox Christians. The Junior UOL delegates responded to the request made of the UOL by the hierarchs, to assist in establishing a monastic community for our Church, by committing to raise $5000 during the coming year for this worthy goal. 1. On behalf of the Resolutions Committee of the Jr. UOL convention delegates, we would like to start by thanking the 2010 Convention Committee for all of their hard work and dedication throughout the year to prepare for this event. We would especially like to acknowledge Mr. Michael Komichak, Ms. Aleksandra Hucul, and Elly Hucul for their tireless efforts that made this successful convention possible. In addition, we'd like to thank both the Senior and Jr. UOL Chapters of Maplewood, New Jersey, and all of their parishioners for devoting their time, commitment, and love to the UOL. 2. We would like to express our deep gratitude to our Hierarchs, His Beatitude Metropolitan Constantine, His Eminence Archbishop Antony, and His Grace Bishop Daniel for the endless love, support, and guidance that they continually show to the members of the Junior League. 4. We wish the best for the succeeding National Executive Board, and we will pray for them as they take on their new responsibilities. May God guide them through all of their successes and endeavors. Good luck! 5. We would like to offer our sincere gratitude to the Junior National Board Advisors, Fr. Anthony Perkins and Melanie Nakonachny for their ceaseless love, support, generosity, and direction throughout the entirety of this year. We appreciate your service in everything you do. May God bless you! 6. Thank you to all of the 49th Annual Jr. UOL Convention delegates. It is through you that the organization thrives, serves, and spreads the word of Christ. We appreciate your dedication to our Church and the League. 7. We pray for the 2011 Convention Committee from Philadelphia. May God guide, strengthen, and aid you as you make preparations for next year's 64th Annual UOL Convention! Good luck! 8. We would like to call to mind all members of the UOL who have fallen asleep in the Lord this year. May God provide them with a place of eternal rest and peace. Vichnaya Pamyat, Memory Eternal. 9. We would like to recognize the graduated class of 2010. Congratulations on all of your accomplishments. Good luck in your future, we pray for your success. We would also like to encourage your membership in the Senior UOL. Thank you for all of your service. 10. We express our sincere gratitude to the following individuals who perpetually devote their time and love to the development of the youth in our Holy Ukrainian Orthodox Church: our Hierarchs for their continuous spiritual guidance, our Spiritual and Senior advisors for their direction, and any other members who care about the spiritual growth of children in our Churches. We would like to extend a special thank you to the Spiritual Advisors of the All Saints Encampments: Fr. Zinovy Zharsky, Fr. Vasyl Sendeha, Fr. John Harvey, Fr. Bohdan Hladio, Fr. Taras Naumenko, and Fr. Anthony Perkins. In addition, we would especially like to recognize Ms. Natalie Kapeluck-Nixon, the director of Youth and Young Adult Ministry, Diocesan Church School Camp, and Teenage Conference, as well Ms. Kira Senedak and Ms. Denise Spoganetz, the directors of the Mommy and Me/ Daddy and Me encampment. Recognition must also be given to Fr. Paisius McGrath for serving as the spiritual director of All Saints Camp. Finally, we would like to thank Oleh and Natalie Bilynsky, Melanie Nakonachny, and Diane Senedak for the work they put into planning the UOL Lenten Retreats. We whole-heartedly appreciate all that you do for our youth. You help us to learn and grow in love for our faith and you touch the lives of those who are vital to our Church's prosperity. 11. Finally, we would like to acknowledge the mission team members who traveled both around the United States and Ukraine in the past year, selflessly giving up their time and love to care for those who need it most. Bringing the light of Christ to those who are suffering, the Junior League supports you fully, and we thank you for your dedication to your brothers and sisters in Christ. We strongly encourage participation in such mission trips in the future and the past, present, and future mission teams will continually be in our prayers. May God grant you many blessed years for the love you show to the less-fortunate. Mnohaya Lita! 1. We assure His All Holiness Patriarch Bartholomew, Archbishop of New Rome – Constantinople the Mother Church, from which Rus-Ukraine accepted the totality of the Orthodox Christian Faith and order 1022 years ago during the reign of the Venerable Great Prince St. Volodymyr, of our filial love, profound esteem and prayers. 2. We offer prayerful support to our Hierarchs in all efforts, through the Ecumenical Patriarchate, to unite the Ukrainian Orthodox Church in Ukraine and strongly encourage His All Holiness Patriarch Bartholomew to intensify efforts to establish a local autocephalous Orthodox Church in Ukraine. 3. We continue to be deeply aware of the chronic shortage of clergy in our Holy Ukrainian Orthodox Church of U.S.A. and truly appreciate the efforts of the St. Sophia Seminary staff in attempting to meet these needs. We acknowledge with profound gratitude the vital ministry of the Staff of Saint Sophia Theological Seminary in the sacred task of priestly formation and education. 4. We prayerfully greet the delegates of the 19th Regular Sobor of our Holy Ukrainian Orthodox Church of the USA and encourage the active participation of the Ukrainian Orthodox League in the Sobor sessions, addressing the values and needs of the organization as well as the Church as we spread the Word of God among the faithful of our parish communities in the face of the spiritual, social and moral needs of our society. 5. We honor the Blessed Memory of the ten million men, women and children who perished during the insidious genocide created by Joseph Stalin and the Soviet Government, which ravished Ukraine from 1932 to 1933. We strongly urge the United Nations to finally declare this horror to be the genocidal act that it was, not bowing to the revisionist history and propaganda currently being distributed by the Russian government denying the facts of the famine and declaring that it was only part of a general famine throughout the Soviet Union at the time. 6. We applaud the ongoing construction of the Ukrainian Museum of New Jersey – History and Education Complex in Memory of His Holiness Patriarch Mstyslav I (HEC) – on the grounds of our Metropolia Center in South Bound Brook/Somerset, New Jersey. We call upon the faithful of our Holy Ukrainian Orthodox Church to continue to cooperate in and financially support the completion of this construction. 7. We enthusiastically reaffirm in the 63rd year of the Ukrainian Orthodox League of USA our motto - “Dedicated to our Church and Devoted to its Youth,” - and recognize that the fulfillment of this motto is only possible through the intimate relationship with Christ through a life commensurate with His Holy Gospel, which we accept and live without reservation. 8. We extend special gratitude and appreciation to the members of Holy Ascension Senior and Junior Chapters of the Ukrainian Orthodox League for their dedicated efforts in hosting this 63rd Annual UOL Convention—2010. May God bless them for their dedication and devoted efforts for the benefit of the Ukrainian Orthodox Church of the U.S.A.
9. We express our most sincere appreciation to those officers who served faithfully on the Senior and Junior National Executive Boards of the Ukrainian Orthodox League of USA during the past year. May God bless them when we League members may fail in our efforts to express appreciation. 10. We remember Protopresbyter Frank Estocin who fell asleep in the Lord during the past year. May his memory be eternal in God’s Heavenly Kingdom. 11. 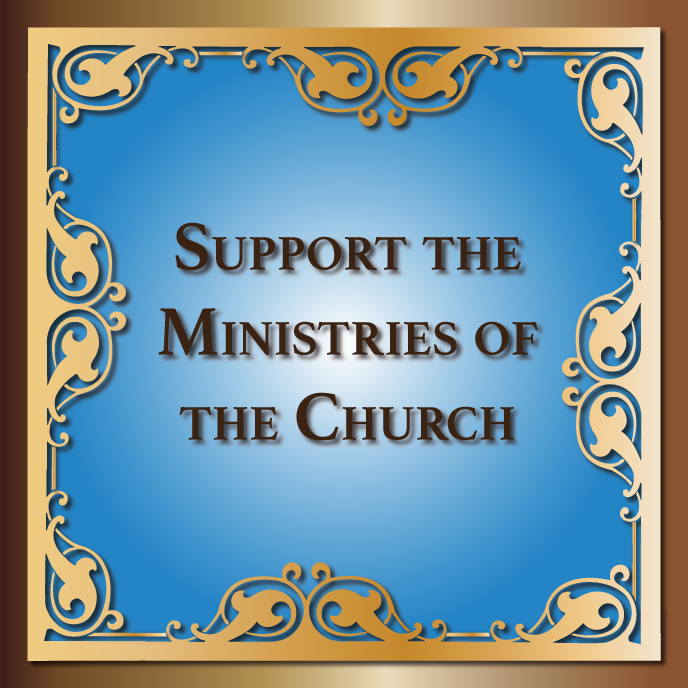 We strongly encourage all parishes of the Ukrainian Orthodox Church of USA to expend great efforts to establish and provide continued support to Senior and Junior UOL Chapters and all UOL programs, activities, and ensure that the traditional convention committees remain active (i.e., Vocations and Clergy Support, Website, Ways and Means, Christian Caregiving and Missions, Youth, Membership and Chapter Development, and Education). 12. We share the joy of our clergy who were ordained to the Holy Deaconate and Priesthood during the past year: Deacon Ivan Synevskyy 9 August 2009; Deacon Boris Kroner – 13 September 2009; Rev. Fr. Siloan Rolando – 18 October 2009; Deacon Charles Sanderson – 31 October 2009; Deacon Oleh Sasiuk – 13 December 2009; Deacon James Cairns – 10 April 2010 and Rev. Fr. Ivan Synevskyy – 5 June 2010. We also greet those clergy celebrating significant anniversaries of ordination: Protopresbyter Michael Zemlachenko – 55 years; Protopresbyter Alexis Limonczenko – 55 years; Protopresbyter Nestor Kowal – 45 years; Protopresbyter Hryhorij Podhurec – 35 years; Protopresbyter Taras Chubenko – 30 years; V. Rev. Volodymyr Paszko – 30 years; Rev. Fr. Andrew Rogers – 25 years; Protodeacon Sviatoslav Novytsky – 25 years; V. Rev. Volodymyr Wronskyj – 20 years; V. Rev. Evhen Kumka – 20 years; Archimandrite Raphael (Moore) – 15 years; V. Rev. Oleh Hucul – 15 years; Rev. Fr. Walter Kvostyk – 15 years; V. Rev. Michael Kochis – 15 years; V. Rev. Taras Naumenko – 15 years; V. Rev. Volodymyr Steliac – 15 years; Deacon Dennis Lapushansky – 15 years; Rev. Fr. Vasyl Kryshtompol – 15 years; Rev. Fr. Paul Bigelow – 15 years; Rev. Fr. Paisius McGrath – 5 years; Rev. Fr. Gabriel Rochelle – 5 years and Rev. Fr. Victor Wronskyj – 5 years. 13. We celebrate and greatly appreciate the staff and volunteers of the Ukrainian Orthodox Church Camping Programs – the Teenage Conference, Church School Camp, and Mommy/Daddy and Me Camp – for their dedicated efforts with the youth and families of our Church. We encourage all parishes, UOL Chapters and faithful to learn more about these ministry programs so that they can enthusiastically support and promote them through prayer, material support and active participation. 14. We encourage the continued support of sister organizations: the United Ukrainian Orthodox Sisterhoods, St. Andrew Society and pray for their continued success. 15. We, as Orthodox Christians, repeat our firm belief in the sanctity of life – from the moment of conception to the moment of natural death. Our Lord offered the ultimate sacrifice of love – His very own life on the Cross – for the sake of human life – the crown of His creation. No attempt to destroy life – at any point or for any reason – can possibly be interpreted as the Will of God. Hereby we encourage the support of Zoe for Life, the Orthodox ministry for women in crisis pregnancy. 16. We encourage all U.O.L. Chapters to reach out to all peoples of their local communities, including new immigrants from Ukraine and Eastern Europe, to become faithful and active members of our Church and the Ukrainian Orthodox League. 17. We continue to encourage each UOL Chapter to adopt a nursing home near its parish and spend time each month visiting its residents – especially those bound to their rooms. 18. We strongly encourage all parishes of the Ukrainian Orthodox Church of the USA to expend great efforts to establish and provide continued support to Senior and Junior UOL Chapters and all UOL programs, activities and Convention Committees. 19. We ask that all UOL members and chapters pray for and support the men and women serving in our Armed Forces through letter-writing campaigns, adopting a platoon, special mention during services or reminders in icon corners and candle stands with yellow ribbons or small USA Flags as well as other appropriate programs. We also pray for the eternal rest of those who have given the ultimate sacrifice of their very lives I faithful service to our great nation. The convention body confirmed bids for hosting UOL conventions through 2015: 2011 – St. Vladimir Cathedral, Philadelphia; 2012 – Protection of the Mother of God, (St. Mary) Cathedral, Allentown, PA; 2013 St. Vladimir Cathedral, Parma, OH; 2014 – The California Parishes and Chapters, in Los Angeles, CA and 2015 – as part of the Centennial Celebrations of the UOC of USA, St. Andrew Metropolia Center, South Bound Brook/Somerset, NJ. The plenary sessions of the convention concluded late this day with the benediction and the singing of Ukraine’s National Anthem. Following the evening prayers, the delegates, alternates and guests departed to Ukrainian Cultural Center in Whippany, NJ for Ukrainian Vechornytsi evening, sharing in the experience of Ukrainian cuisine and village traditions. Saturday, July 31 was a free day during the UOL Convention for reunions and socializing between UOL friends and visitors who traveled from various parts of. The evening was a time of joy and festivity during the convention Grand Banquet and Ball. The major UOL awards and scholarships are always made during the banquet and this year was no exception. The Father Volodymyr Bukata “Orthodox of the Year” Award went to Andrea Karbiwnyk of St. Vladimir Chapter, Philadelphia. The UOL Chapter of the Year Award was presented to St. John Chapter, Johnson City, NY. The Jr. UOL Chapter of the Year Award was presented to St. Michael Chapter, Woonsocket, RI. Metropolitan John Scholarships were presented to Rev. Fr. John Synevskyy, recent graduate from Holy Cross Seminary, Boston, MA and to Subdeacons Vasyl Pasakas, Andriy Matlak, Vasyl Dovhan, and Deacon Borislav Kroner from St. Sophia Seminary. Lynn Sawchuk-Sharon Kuzbyt Scholarships went to: Lesya Mahlay, Anastasia Markiw, Daria Gapon. 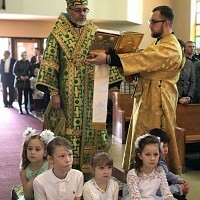 Divine Liturgy took place on Sunday morning in Holy Ascension Parish, Maplewood, NJ. The children of the parish escorted our hierarchs to the church entrance where they were welcomed by Lynn Gulak, Parish President, Oleh Bilynsky, outgoing UOL President and Martha Misko, newly elected UOL President who asked the hierarchs to lead the faithful in the Eucharistic celebration. Very Rev. Fr. Oleh Hucul offered the words of prayerful greeting to the hierarchs, calling upon them to remember in prayers the founders and benefactors of the Ukrainian Orthodox League since its conception in 1947. These were the words of profound significance and humility, as each of the Board members realized the responsibilities and trust that people put in them. Concluding the induction office, the Archbishop presented the Metropolitan of the Church with the newly elected and appointed Senior and Junior Ukrainian Orthodox League national Executive Boards. Metropolitan Constantine concluded the Divine Liturgy with wishing the delegates of the Convention a safe and blessed journey home. Following the Hierarchical Divine Liturgy, the Holy Ascension Senior and Junior UOL chapters sponsored a Farewell Luncheon at Holy Ascension parish hall, following which the “farewells” were exchanged, accompanied by sincere smiles, tears of joy and hope that the Holy Spirit will guide the UOL into the vision for 2020, which was proclaimed during the convention sessions. Everyone promised to return for the 64th Annual UOL Convention in 2011, which will be hosted by St. Vladimir Cathedral Sr. and Jr. UOL Chapters, Philadelphia, PA.
2010 Winter Mission Trip to Ukrainian Orphanage!